In addition to these war crimes, the urban areas of Sudan saw wide range of human rights violations. The Gestapo-like National Intelligence and Security Service (NISS) of the ruling National Congress Party (NCP) became a terrifying political tool of terror that is used Bashir’s regime to abduct, indefinitely detain, torture and kill political opponents with huge authorities and complete impunity for its agents. Expectedly, this was accompanied with an unprecedented spread of corruption in Sudan in light of the complete absence of the rule of law. Fast forward to 2018, the demonstrators who stormed the streets of different Sudanese cities had a clear sight of the scene. The protests started in Atbra, a city well known for its labour movement history, on December 19. 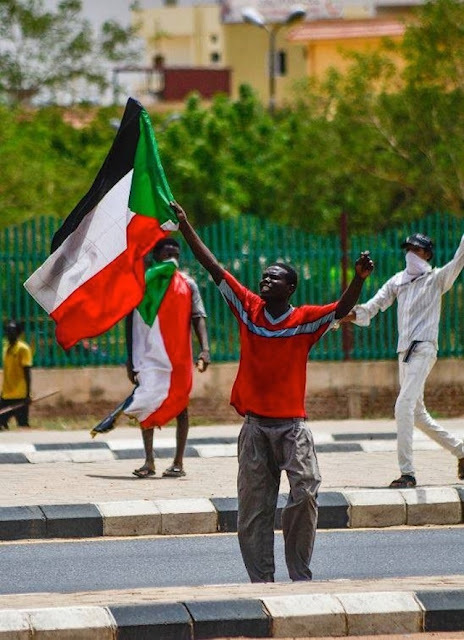 Other cities witnessed protests in the same day including; Qadaref, Nuhod, and Portsudan that was supposed to receive a presidential visit from Bashir in the same day. Protests extended to other cities in the following day; Dongla, Barbar, Sennar, Elobaid, and the capital Khartoum. The third day saw the spread of protests to almost everywhere in Sudan. Protesters were very focused on what and who is the reason behind their suffering. In most of the protesting cities, citizens marched collectively to burn the premises of the ruling National Congress Party. The ruling party’s center were not only symbols of tyranny and dictatorship, but also a kleptocratic symbol of the grand corruption encircling Sudan. Despite the structural deformity of the Sudanese economy that is inherited since the independence, which is seen in its dependence on exportation rather than production, which exacerbated by the Dutch Disease: “Increasing dependence on the export of one natural resource with neglecting the rest of economic sectors” during the years of oil exportation between 1998 to 2011, and the great shock that hit the Sudanese economy after the independence of the oil-rich South Sudan, but the current economic crisis is different. These economic uncertainties have created money-hungry nacropaths of those have limitless power and authority in Sudan, seeking to collect as much assets and money as possible to protect and maintain their privileges. The corruption in the banking sector, fake credit and investment loans that are granted to senior members of the ruling party without adequate guarantees and without productive returns ... and other corrupt practices have led to the loss of confidence in the banking system by the citizens. The loss of confidence in the banking system was aggravated by the shortsighted decisions taken by the government to address the problem of liquidity by placing a very small daily withdrawal ceiling from personal bank accounts. Amounts that are not enough to meet the obligations of daily life in light of the rapid rise of prices, provoking people to store money in their homes instead of Banks, aggravating the impact of the liquidity scarcity and the corrupt practices of currency speculation. Untouchable influentials including members of the presidential family (which includes the prime minister himself who is the cousin of the president), senior members of the ruling party and high-ranking government officials use these practices to promote their social status and protect themselves in the case of any change in a very fluid political situation. Ignoring the fact that they are worsening their situation and rising the possibilities of change by aggravating the suffering of the people. A typical nacropathic behaviour. The anti-corruption tools and slogans have become part of the battle of settling personal accounts among the regime's masters, and have not reflected in any positive way on the Sudanese economy. This made statements by the new prime minister and his tweets (and Muataz Moussa is fond of the social media platform; Twitter in a Donald-Trumpian style), to a ridiculous farce, trying to suggest the possession of economic solutions to a problem that everyone knows it is political in nature. On another note, the regime does not help himself by any mean by its refractoriness in dealing with the other aspects of the political crisis in Sudan. The ruling National Congress Party continues to manipulate and obstruct all opportunities for political solutions to end the civil war in its three volatile regions of Sudan (Darfur, South Kordofan and Blue Nile) and allow for a minimum openness that help reducing the political polarization in the country. Succeeding in that with the help of its new status with the international mediators who needs the regime to serve their different interests in the region. As well as the weakness of the opposition political forces that, the regime invested in their destruction over the years of his rule. Never the less, the NCP is digging its own grave with this attitude. These civil wars, political polarization and lack of democratic space keep it a permanent hostage to the bullying of foreign powers who uses it to perform the tasks they want, but only support it by the extent that keeps it hostage. Tyrants read from one book that does not teach them a simple lesson; the only guarantor of any ruler is his people, not foreign powers, whatever the degree of his service to them. The National Congress and General Bashir have been in power for 30 years depending on the strength of their security services and their military militias to stay in power and suppress the opposition movement. They did not hesitate to arm and supply them and to create more diverse militias dedicated to protecting their power. They directed the budgets of health, education and other social services to be spent on what is generally called the sovereign and security sectors. Absurd expenses that consume more than two thirds of the public budget. This reluctance to direct public fund to social service sectors has made the economic crisis even worse on the poorest groups, which now face their fate in a legendary battle with no social protection net or any services from the public sector. Those people are the ones who are taking the streets now, driven by their will to live. They will not lose anything because the National Congress Party has left them nothing to lose, but everything to gain ... their freedom, security and decent living. The regime still not recognizing this, and continue to depend on its security measures to address the crisis. The death toll of protesters reached several tens in three days of protesting. Live ammunitions are being used heavily in the different cities of the country. The scenario of September 2013 protests, when the security forces killed over 200 protesters in the streets who were demonstrating for similar reasons is likely. The NCP masters who seem to learn nothing from it celebrated this massacre as a success in putting out demonstrations. Security solutions won’t work and never did. However, with the national wide political fatigue another terrifying scenario emerges: an internal coup within the NCP. The chief of NISS; Salah Quosh, who returned to his position in the beginning of this year after the humiliating expulsion in 2012 and even his detention and accusation of planning a coup, publicly blamed the cabinet on the economic crisis and how it dealt with the protests. Quosh ambition to succeed Bashir is not a secret and was the reason for his expulsion in 2011. However, he is not the only one with such ambitions. Old-guard Islamists are also looking forward for the throne. The Islamists hardliner group headed by the previous presidential aide Nafie Ali Nafie, who disagreed on Bashir’s will to rerun for 2020 elections as NCP candidate for presidency, are prepared for a battle. Unrest within the army also creates potentials for a Sisi’s style coup d'etat. What is terrifying in all these scenarios is that it will not provide any solutions, and keep the same kelptocracy in power with some superficial changes on hierarchy. Hence, people suffering will continue with the replacement of an old fatigued dictator with a fresh euthanistic one. Let alone, the most terrifying possibilities of blood bath in Khartoum resulting from the clash between the numerous militias of the NCP; the Rapid Support Forces, the Security Forces and Army, whose allegiances are scattered among the different wings of Islamists and will have to pick a side in such scenario. People and normal citizens will also be part of such clash. Those who are sacrificing their life in the streets now will not accept being a silent watcher. The only peaceful way to end this would be for the NCP to understand and see that its game is over. It is time to hand over power to a broad national political alliance and face the consequences of 30 years of corruption and mismanagement instead of taking the country in such dangerous pathways. What is happening now in Sudan is the labor of a complete comprehensive change ... a genuine revolution born of the suffering of a patient people. The only objective of any sane politician should be to end this suffering.